Entering the 21st century, as human beings attach more importance to the protection of the environment and ecology, green environmental protection will become the basic requirement for home appliance products based on the market. The European Union has promulgated two decrees, the Waste Electrical and Electronic Equipment Directive and the Directive on the Prohibition of the Use of Certain Hazardous Substances in Electrical and Electronic Equipment, to provide higher environmental protection requirements for the manufacture of electrical and electronic products. According to industry insiders, the EU's two decrees are mainly aimed at raw materials and accessories for televisions, computers, air conditioners, refrigerators and other products, which will affect about 270 billion U.S. dollars in export value of over 2,000 domestic enterprises in the home appliance industry. The impact will be revolutionary. Packaging is the continuation of the product production process and is also an important part of the product distribution process. The two decrees issued by the European Union at the beginning of the year will accelerate the global environmental protection process for electronic products. It is undoubtedly a strong catalyst for China's home appliances and packaging to go on a "green environmental protection" track. Green packaging is in line with the world's green consumption trend, which is conducive to breaking through the international green trade barriers. It will also play a positive role in reducing the breakage rate of goods in circulation, improving the quality of packaged products, and adding value to commodities. Green packaging covers the environment from raw materials to the production of products without pollution to the environment. It can be recycled and reused, and it can be packaged in nature. Green packaging is the most inspiring packaging revolution of the 21st century. It is an important part of the green wave. Experts believe that with the improvement of material living standards and environmental protection awareness, people's requirements for â€œpackagingâ€ have also undergone great changes. In the past, what people think most about packaging is her protection of the product, followed by its economy, and now people are most concerned about the ecological characteristics of packaging, including the impact on human health, the impact on the social environment and packaging waste The ease of handling and so on. Therefore, in the packaging design and development of new materials, packaging workers should pay attention to their use, recycling, resources, environmental protection and other issues to make a comprehensive consideration, to be non-toxic, harmless, easy to use after recycling or natural decomposition, In order to achieve the greatest social benefits, the governments of various countries have now formulated packaging regulations and decrees that require manufacturers, importers, and retailers to truly take responsibility for protecting the ecological environment. With China's accession to the WTO and the development of economic globalization, foreign trade has grown tremendously. Enterprises are facing good opportunities for development, huge markets and challenges, and the integration of electronic products and packaging with the international market is increasingly important. In particular, the current European Unionâ€™s import quota for Chinese household appliances has been thawed. The EU is becoming another important market for the export of household appliances in China. However, European Union countries use wooden pallets, wooden crates, EPS foamed plastics and adhesives, and printing inks and coatings. There are strict restrictions and regulations for packaging materials, accessories and packaging waste. If you enter the German product packaging needs to apply for "green" logo, enter the French commodity packaging need to apply for "vertical point" sign, in particular, do not easily adhere to the EU restrictions on lead, mercury, cadmium, polybrominated diphenyl ether and polybrominated Benzene and other harmful substances, so as not to lose due to small. From the viewpoint of improving the green packaging image of products and reducing the cost of waste recycling and recycling, it is imperative and necessary to research, develop, produce, promote and apply â€œgreen packagingâ€ materials and products from the perspective of avoiding â€œgreenâ€ trade barriers. The significance of honeycomb paperboard, pulp molding and plant fiber packaging materials products to save resources, protect the ecological environment, in line with international packaging trends. China's environmental protection packaging for electronic products has achieved gratifying results so far. Such as mobile phones, telephones, fax machines, printers, keyboards and other small, light electronic products, gradually using pulp molded products as packaging materials, replacing the EPS foam plastic cushioning materials, some export electronic whole machine The packaging of instruments and household appliances replaces wooden pallets, boxes and EPS foam cushion liners with honeycomb paperboard eco-friendly materials. 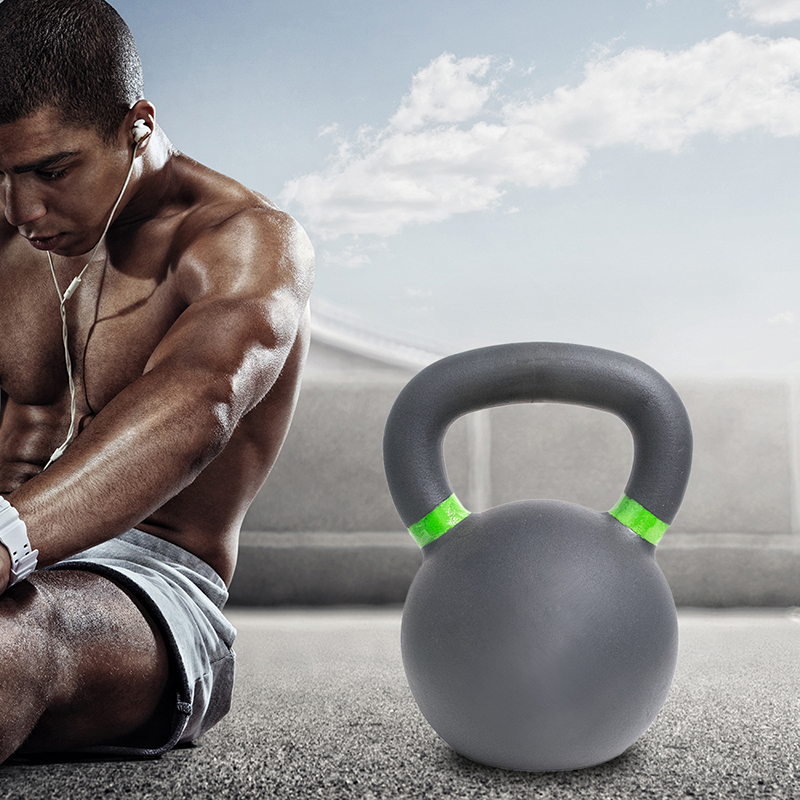 Powder Coated Kettlebell is made of cast iron, and treated with powder coating finish technologies to reach protective and decorative purposes. Powder coating are based on polymer resin systems, combines with curatives, pigments, leveling agents, flow modifiers, and other additives. These ingredients are melt mixed, cooled, and ground into a uniform powder, then a process called electrostatic spay deposition (ESD) is typically used to achieve the application of the powder coating to the metal substrate, then through heat ovens, the powder is successfully applied to the bell surface. Powder coated kettlebell are more durable and attractive than liquid painted ones. Thus reduces the risk of scratches, chipping, abrasions, corrosion, fading and other wear issues.